Today: A breakfast to cuddle up with. Maybe I have an unacknowledged subconscious fear of Purgatory? Maybe I just never don’t add cumin and paprika to something when that thing could have cumin and paprika. This week, however, cozied up inside on yet another snow day (I wish I had invested in hot cocoa stocks earlier this winter! I would have made a killing by now. ), I thought, ‘actually, today I may not want cumin and paprika." My mind turned to the wonderfully simple but richly flavorful “winter tomato sauce” from Lynne Rosseto Kasper’s tome, The Splendid Table. No disrespect to Marcella and her most excellent sauce, but in midwinter, there’s just something about Lynne’s, filled as it is with niblets of vegetables and the fragrance of wintery herbs, that speaks to me more. I decided to stew up a batch, and I added some thinly ribboned kale to make it even heartier, and stewier, and because we all add kale to everything these days, don’t we? I cracked in my eggs, cooked them until they were barely set, broke off a chunk of bread, and I feasted -- and figured the snow days can just keep coming if they want to. I have eggs in Purgatory. And I may still have time to invest in hot cocoa stocks. I made this last night. I love how flexible this recipe is, it'll be easy to play with if you have different greens, fresh tomatoes, etc. The goat cheese definitely added a layer of decadence! Totally flexible. It's a recipe that caters beautifully to your mood and what you have on hand! 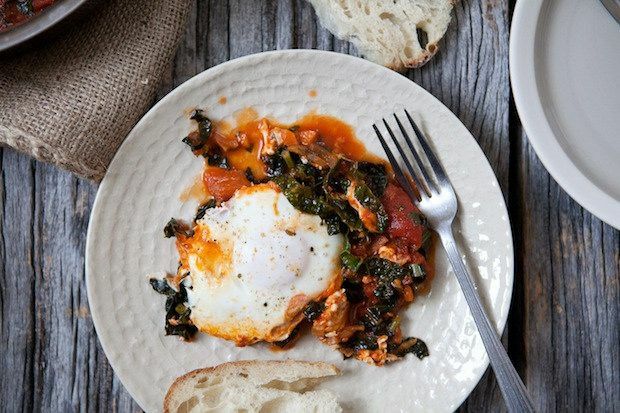 This recipe got me out of bed today. Delicious! Glad to help start your day right! This would be so perfect on a snowy day! Looks beautiful! I need this for dinner tonight. Thanks CIV! 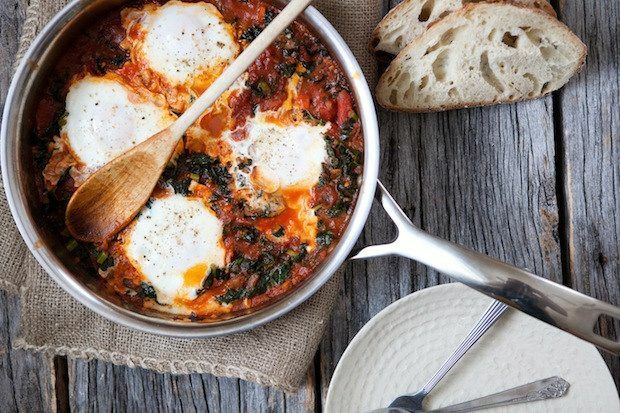 Glad you enjoy the streamlined shakshuka! That's the one I make pretty much every week. But now I might have to start alternating it with this one regularly. And I agree, The Splendid Table is amazing, as is Lynne Rosetto Kasper. I love her. I agree! I would eat this any time of day! This recipe speaks to my soul. My soul needs this recipe. Perhaps this recipe will keep my soul out of Purgatory. QED I have to make it immediately.